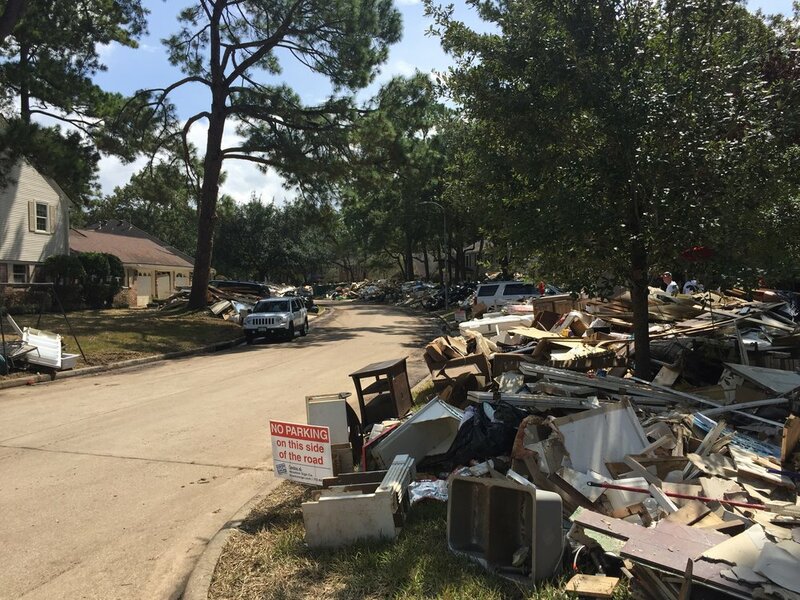 Our trip to Houston is not like most global ministry trips: it wasn’t planned far in advance, and it certainly wasn’t the type of trip you pray to come about. On August 25, 2017, Hurricane Harvey made landfall in southeast Texas as a powerful Category 4 hurricane, with 130 mile per hour winds, rains, and strong storm surges. As most of us do in times of disaster, we began praying for safety and peace for those in Harvey’s path. However, though the storm’s winds had calmed by August 27 to 40 miles per hour, it stalled as a low pressure front above the city of Houston and dumped nearly a year’s worth of rain in just two days. The images on the news of people being rescued from their homes on national news media were startling. Then, on August 29, two of the cities flood control reservoirs breached, adding to already high floodwaters. As more and more images and videos of the flooding were shared on national media outlets, it became clear that there would be great needs in the city of Houston both in the short term, and for many years to come and that Johnson Ferry could have some sort of role to play in fulfilling those needs. Our ministry partner here in Houston is Houston First Baptist Church. When the floods began to recede and it was safe to begin helping and serving the community, their congregation mobilized-first serving their own members, then their neighbors families and the entire community. While their church is indeed still acting as the “local church”, they are also functioning as a disaster relief center, and they have mobilized each of their staff members to serve in a disaster relief capacity in addition to whatever their normal roles are. Currently, the North American Mission Board is using the church as its home base in Houston, and the church is also hosting many other groups from around the country that are simply coming to serve. So, what exactly are we doing in Houston? The short answer is being flexible. The needs in this community are literally changing day to day, so we are here as willing servants of Christ going wherever we need to go, and doing whatever we are asked to do. Our team is prepared to do anything from mucking out houses (when a flood comes, you have to tear out all the sheet rock, and throw out any belongings covered by the water because the water is often mixed with chemicals or even raw sewage) to light construction. And while there are many humanitarian organizations, individuals, and teams out with the same mission of helping people, our mission goes beyond the temporal. Our mission is not simply to accomplish tasks associated with recovery, but to participate in the eternal task of expanding the Kingdom of God. Whenever we encounter a homeowner in need of help, we make it a point to pray with that individual and as we form relationships with the homeowner, our team is sharing the good news of Christ. Amidst this flooding disaster in Houston, God has called us to be the people who bring comfort in Christ. Please continue to be in prayer for the people of Houston and pray that our team would have open eyes to know when and with whom we can share the gospel while we are here.